Jams, Jellies, Conserves, Fruit spreads. Available in many flavours and textures. Yesterday I checked my post office box to find a parcel waiting for me. From my good friend JahTeh. You'll find her at Copperwitch. Look at all the stamps!!! 20 of them! I know a stamp collector who is going to love receiving these. Most of the stamps are in memory of the men of the Kokoda Trail. And then there's this one. Travel Smart. I have never, ever seen one of these. Two books. One by James Lee Burke, who is one of my favourite authors, and one by P.J. Tracy. I haven't read many books by P.J.Tracy, so I'm looking forward to this one. Also included were 4 pairs of earrings. Thank you so much JahTeh! and diamonds and pearls. To wear when I go visiting royalty? Or just plain visiting. dented or otherwise damaged cans, what do you do? This article in yesterday's paper caught my eye. Forget the sensational headline for a minute and focus on the can. Notice how it's a littleblackened around the bottom rim? I'm not sure it shows, but it looks like the can has been standing in wet conditions, the wrapper looks a little wrinkled too at top and bottom. Was it like this when it was bought? If yes, why buy it? If no, then how was it stored in the home environment? Usually irrelevant, unless the can has been opened. We all know that once a can is opened the contents need to be used immediately, especially baby foods. She mentions somewhere in the story that the contents appeared "a bit runny". This happens when food is given to the baby directly from the can, (or jar) with saliva from the baby's mouth being transferred to the contents, which then begins to break down the molecular structure of the canned food. 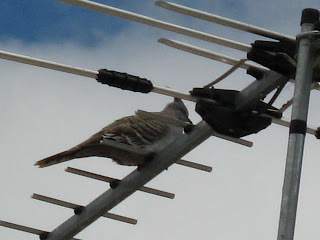 Antennas are a favourite resting place. One very hot day last summer I came home from work to find this little fellow sitting in the water dish. He tried to hop away when I walked into the carport, but just didn't have the energy. He stayed there for hours, hopping in and out of the water. where would I choose to be? And what would I like to be doing? My immediate answer was "not here that's for sure". He then said I should give it some thought. If I had unrestricted choice, globally, where would I like to be? And what would I like to be doing? Since then, I've been thinking about it. My first thoughts were for faraway places that I've always wanted to see. All of these are English speaking places and I would love to live in each one for a summer. No winters, I couldn't handle snow. So I'm trying to think of places in Australia where I would love to be. Where I would love to live for the rest of my life. I'm growing a vegetable or two, having short showers, recycling my packaging. I try to cook one pot meals as much as possible, so I'm using only one hot plate. I do only two loads of washing per week. One clothes, one sheets and towels. But I've recently bought an electric blanket to help my back relax while I sleep. I have the airconditioner which I use in the summer. I have the column heaters, one is used every night after the sun goes down, the other much less often. ...to help me get my washing dry, instead of using the dryer. It's a fold away washing line, available from K-Mart, camping goods stores, probably the sporting and camping sections of large department stores as well. You can see that it holds quite a bit. The frame is light weight aluminium and comes apart to be folded into a long zipped bag similar to a gun bag. I've never grown cauliflower before. I've tried.....but they've usually died, or been eaten alive. Cauliflower number one has a teeny little head forming, it's about one inch across. Cauliflower number two has an even smaller head, about half an inch across. Cauliflowers three and four are just leaves so far. I'm looking forward to picking and eating these. I love cauliflower baked in a cheese sauce. I could hear noises on my roof, above the living room, so I sneaked out the back door, sneaked around the house and onto the front lawn. There were two huge black crows on the roof! And I didn't have my camera...dammit! A customer in shopping yesterday with two small children, bought them each a treat for being good. The treat? Not what you'd expect! She bought each child a junior electric toothbrush. After I'd scanned them, the mum opened the packaging and showed them how to hold them as she turned them on. It was the cutest thing! A little girl giggling with delight as the toothbrush buzzed against her teeth, the slightly older boy inspecting his and asking how did it turn on and off. Very strong winds here in Adelaide last night and today. Remembering what happened with my antenna earlier this year I listened carefully but didn't hear any of the creaking and groaning heralded the ripping away of the barge board the antenna was attached to. Thank goodness! Why do we separate our recycling products? Paper and cardboard into one bin, glass in another, plastic into a third. I noticed an advertisement in a magazine yesterday for a set of kitchen bins designed just for this purpose. They look to be quite large and I don't know anyone that has enough room in their kitchen for a set like this. My point is, when it comes to rubbish collection day, all recyclables go into the one big wheelie bin anyway. From thereit gets tipped into the massive truck that's doing the collecting. At the collection centres all this is tipped into huge bins which feed onto conveyor belts. People standing either side of these belts pluck out glass or plastic and toss it into bins beside or behind them, the paper is left to go to the end of the line and tip off into its own bin. Back in the early 90's we rented a large house with a garage that had been converted to another room. Most of the kids were with me, the oldest with her partner and daughter were in the big garage room. When they moved out, second eldest and his girlfriend came home and moved in there. With his drum kit. So the house was always full. Along the back of the house was a porch, very wide, and running the whole length of the house before turning the corner to a larger open porch area behind the garage. This was our barbecue area. We had a huge old fig tree, a lemon tree, a grape vine along the back fence and a big old fashioned Golden Queen peach tree. Freestone peaches. BEST PEACHES IN THE WORLD!! They grew to softball size, golden yellow with a soft rosy pink blush. The above sets of steps are all part of the Parade Central Mall I featured last Friday. This mall houses a few cafes and the Hoyts Cinema Complex. The last set of steps above, (same steps, different angle) is at the back entrance to the Foodland Mall. I love my electric blanket, I really do. A little one, but a problem. The trouble with electric blankets is the cord. It makes tucking in the sheet properly difficult. Thelittle bit that doesn't tuck in where the cord is, just looks untidy. I've come up with a yet-to-be-implemented solution. At the spot where the electric blanket cord is. Making the bed will become simple again. Unplug the cord, feed it through the "buttonhole", tuck in the sheet. I took these photos one morning a few weeks ago on my way to work. I'd left early so I wouldn't have to rush, so had plenty of time to take photos. Situated at the intersection of The Parade and George Street. Do you remember the very first time you were allowed to handle a knife? Up until this day, my food had always been cut up for me, sandwiches made by mum or dad. Eating utensild being only a fork and a spoon, junior sized. I'm not sure how the invitation came about, but one day when I was five, we were having lunch at someone else's home. The boy in the family, having finished his bread and butter, picked up another slice of bread and his knife, hisknife, (not junior sized either) then calmly and competently buttered his bread. And so very, very, jealous! I positively seethed with jealousy and injustice. And here was this boy, younger than me, (by at least four months, possibly six...) usingaknife! A younger than me boy! Well! I just couldn't sit by and let a small boy get the better of me! I asked my mum if I might please have a knife as I'd like another piece of bread. This cake often sinks in the middle (because of the golden syrup weight I think), so when yours does this, it's not a failure, neither are you. oh wait, it's nowhere near Christmas yet. This is just about the ivy. We all know I live in a block of units. Right behind is an identical block of units. The unit directly behind mine has a new family, with a toddling baby. About one year old or thereabouts. The mother brings him outside to play every afternoon for about an hour. The unit behind me also has ivy growing along and through the back fence. It's been there since before I moved in over eight years ago. It's a big stand of ivy. Some of the stems are quite thick and tough. I've been trimming back the edge whenever it gets too close to the lawn, but that's it. I'm not fussed about the ivy. The new family however, is fussed. The ivy hides all manner of creepy crawlies. Today while I was reading emails, I heard lots of scraping noises coming from the fence area. I looked out the back window just in time to see a clump of ivy being pulled back through the fence. Not eating properly, not wanting to cook. Not sleeping well, although napping a lot. Weird dreams that I didn't remember at all, knowing only that I'd woken several times during the night. Hiding away at home, not wanting to go out, not even to take photos. I was......I hesitate to say depressed, I'll go with lethargic, despondent. I'd been thinking about my future and becoming increasingly worried. Low paying job, low hours, no savings. I have food, clothing, a roof over my head. But, my rent is high. (And gets higher every year). Working full time, it wouldn't be a problem, but I no longer work full time. There are physical limitations and the body is feeling more and more tired. Dammit, I'm getting old! When did that happen?? Anyway, it's what I've been hearing and reading that has gotten to me. Rents going up even higher. 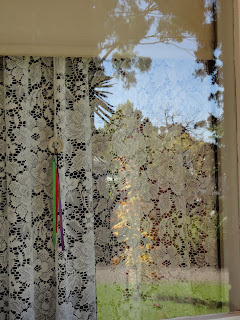 All of these are photos of the yard and fences reflected in the windows of my home. I was outside looking for bugs to photograph, but on noticing the reflections, I decided to take those instead. To join in with SundaySelections, post photos of your choice under the Sunday Selections title, then go to Kim's site, add your name to her linky list and leave her a comment. why does teal green always photograph blue?